How "apped" are you to use a smartphone for health? The use of mobile health technologies is revolutionizing the exchange and consumption of healthcare data. HIN's inaugural survey on Mobile Health captured mHealth trends from 150 healthcare organizations. This infographic illustrates the top technologies, reasons for using mHealth, targeted conditions, greatest challenges of mHealth and more. 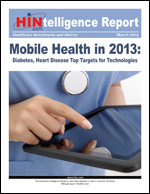 More information on this topic can be found in 2013 Healthcare Benchmarks: Mobile Health. This exclusive resource delivers a snapshot of mobile health (mHealth) trends, including current and planned mHealth initiatives, types and purpose of mHealth interventions, targeted populations and health conditions, and challenges, impact and results from mHealth efforts.